So I’ve got a steak and a knife. But what am I going to do with it? Stir fry seemed a natural choice. All that chopping and cutting. I use a chinese style cleaver for virtually all my cutting needs..It sharpens up everytime time with just the slightest kiss of the steel and will slice, chop, carve, crush…pretty much whatever you ask of it…And you can do that Jack Nicholson thing from ‘The Shining’…..Result. Now I saw one of those in the shop but just thought I might get carried away with it. So far I’ve managed to control myself, (but vegetables cower when they see me coming)…. That’s serious cooking. I’m still after a decent oven with a door that actually shuts properly. High quality knives are essential. You really don’t need many gadgets. 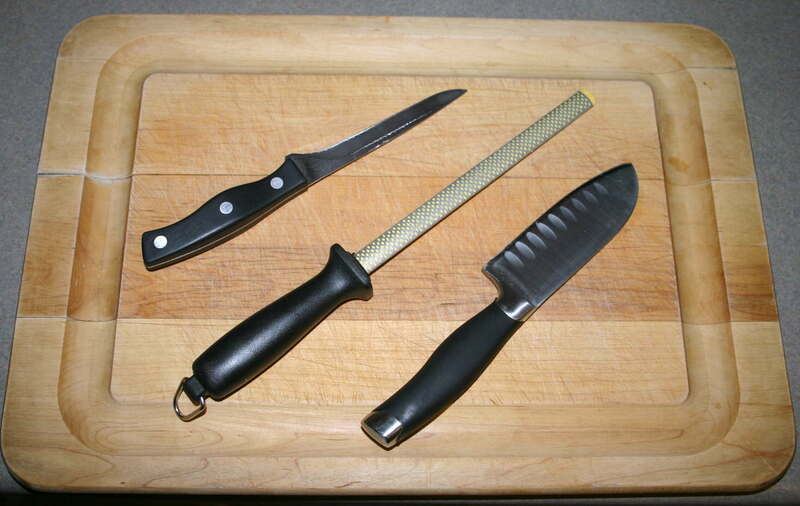 A chef knife, paring, and 6″ utility knife will accomplish most tasks. Your (washed) hands can take care of the rest. If you don’t abuse the bejesus out of your knives, and use a honer like this one, you should never (well maybe) have to have a professional put an edge back on your knife. Yep, gotta have sharp knives to do the job right !!! I like that you didn’t trim all of the fatty goodness off !! God no – if you’re going to eat this kind of thing, you’ve got to eat it all! I live a big sharp knife, of course, but my absolute favorite tool is the lowly, low-tech citrus reamer. Mine’s made of wood and cost three dollars. I haul it out of the drawer, give the lemon or lime the business, rinse it off and let it drip dry. No muss, no fuss. Amazon has them, and no home should be without one. just finished eating a big rib eye myself. Had it with dauphanoise potatoes and crunchy beans. They were pretty epic though the potatoes were overdone. My favourite kitchen implement is also the cooks knife. However, you need a steel or sharpening stone to avoid it becoming just blunt enough to slip yet, amazingly, sharp enough to cut your thumb to the bone. I’ll keep that in mind. I’ll also keep in mind not to start chopping things up after I’ve hit the vino on a Saturday night. That looks absolutely amazing, I must try this one out! Nice knife! There is nothing quite as nice as a new sharp knife. Your ribeye stir fry must have been very tasty…it sure looks good. I have a counter top convection toaster oven that I use every opportunity. It cooks much quicker and more evenly than the gas oven. Looks good! A big, sharp chef’s knife is my favorite kitchen must-have. I have an abnormal love for chopping. Yes I love it, it slices through tomatoes and everything. Wasnt even a falsh one or anything!